Elijah, like all babies, goes through periods of not sleeping, crying jags and general grumpiness. 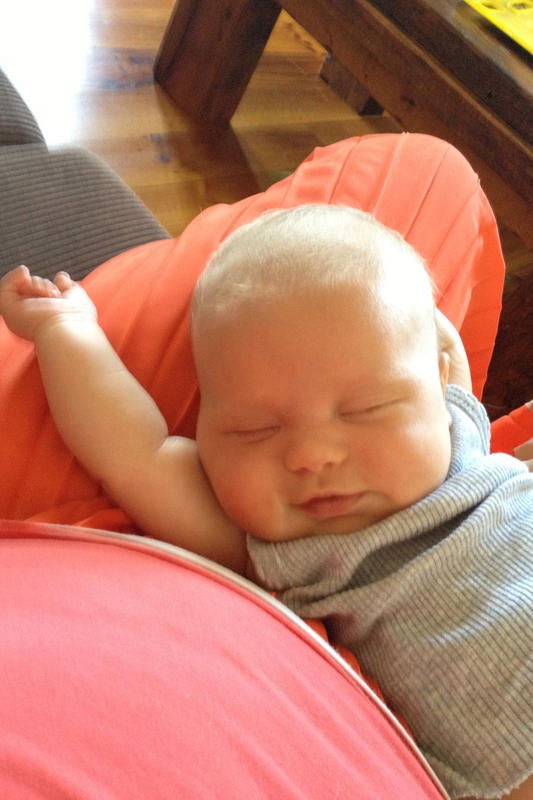 On the whole, he truly is a “good” baby, but even good babies have their off days. Good mothers have them too. But I won’t tell you about those days. Not because I am trying to hide behind the image of a perfect baby and mother. But because it would seem too close to ingratitude. When you are robbed of your child, you feel robbed of your right to complain about anything other than that loss. How can I complain about transient things? Everything becomes insignificant in the face of such giant loss. All other problems dwarfed. And to complain about a child, the very thing that I lost, that would be an ingratitude too great. Grief teaches you things. Teaches you to to appreciate each moment. You begin to understand the enormous privilege it is to bear and bring up a child. You start to glimpse the compete preciousness of it all. You meet those that are desperate to have a baby to hold in their arms, not just in their hearts. And you realise, even though you have had the most horrible thing to occur, how truly blessed you are to have children. You cannot help but wonder if you needed to lose in order to learn that lesson. You hang onto appreciation as a kind of insurance. If I am grateful for each moment, then Elijah can stay. If I consciously appreciate every single second of him, I can protect him. Conversely, if, for even a moment I lose sight of that, maybe he will be taken from me. I must not complain. After Xavier died I would see Facebook posts or hear whinges about babies that wouldn’t sleep or were fussy. I would wish, wish that were me. I would wonder how people could be so blind. I would vow never to be so unthinking. But does the pendulum swing both ways? Is all this thoughtful gratitude and gushing presenting an unrealistic image of life? Am I expecting too much of myself and pressuring others? Is it just as unthoughtful of me to be posting photos of a picture perfect, content baby all the time? After all life does goes on and it continues to be challenging. I wish that Xavier’s death had solved all my problems. All the problems of my friends and family. But it didn’t. Perhaps it offered some perspective, but it didn’t eradicate all other pain and it didn’t magically make our lives easy. After Xavier’s death it took a little while before friends and family would once again discuss their problems with me. I was glad when they did. Glad that they thought my perspective would be useful. Glad that they thought I could cope. But I know even then they were careful not to complain, not to give any inference that they weren’t completely grateful for their blessings. Perhaps the answer lies in living with grace, rather than finding limitless gratitude for every moment and a moratorium on complaints. Living with the grace that I know no matter what life throws at me, I will handle it. Living with the grace that I know I can see beauty, even in the darkness. Living with the grace that problems still occur, to me and to others, and that listening and talking about those things doesn’t make me ungrateful. It just makes me human.